You can declare a new RadRichTextEditor as any normal WinForms control. 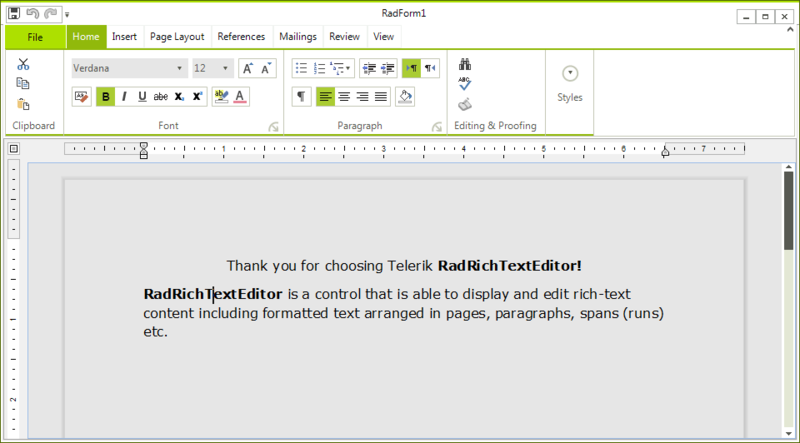 If you want to allow the user to edit and format the content of RadRichTextEditor, you have to create UI and use the API exposed by RadRichTextEditor. The API exposes methods (like ToggleBold(), ToggleItalic() etc.) that modify the text in the control when called. Here is an example of using the API for making the text bold, italic and underlined. The whole hierarchy of the elements can be found here. This document is editable. To make it read only you have to set the IsReadOnly property of the RadRichTextEditor to true. To learn more about the read only feature read this topic.